This volume contains several works composed by St. Fulgentius (468-533), an African bishop. It belonged to the abbey of Lobbes in Belgium, as shown by the fact that it contains at the end a list of the books in the library of the abbey, dated 1049, as well as a 12th-century note at the front recording a number of books which were saved from a fire. 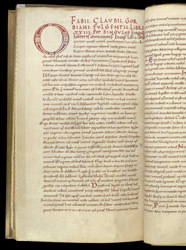 By the 15th century, however, the manuscript was at Durham Cathedral, as shown by the library press-mark. This page shows elements typical of 11th-century manuscripts: the initial 'O' is of simple design; the rubric is written partly in rustic capitals, and partly in caroline script; the main text is written in a single column of caroline script; prickings are visible at the edge of the leaf.